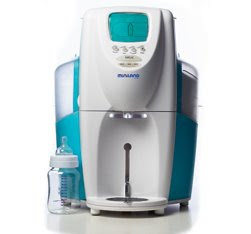 This cool Miniland Baby dispenser integrates all necessary functions in a single device: sterilizes the bottle, sterilizes and heats the water to its ideal temperature, mixing water and powdered milk in the right proportions and dispenses the bottle. Is filled easily with mineral water or tap, (2 l capacity). Holds 700 grams of milk powder. Fills the bottle with cold or hot water. Can Sterilize 3 bottles in 8 minutes.